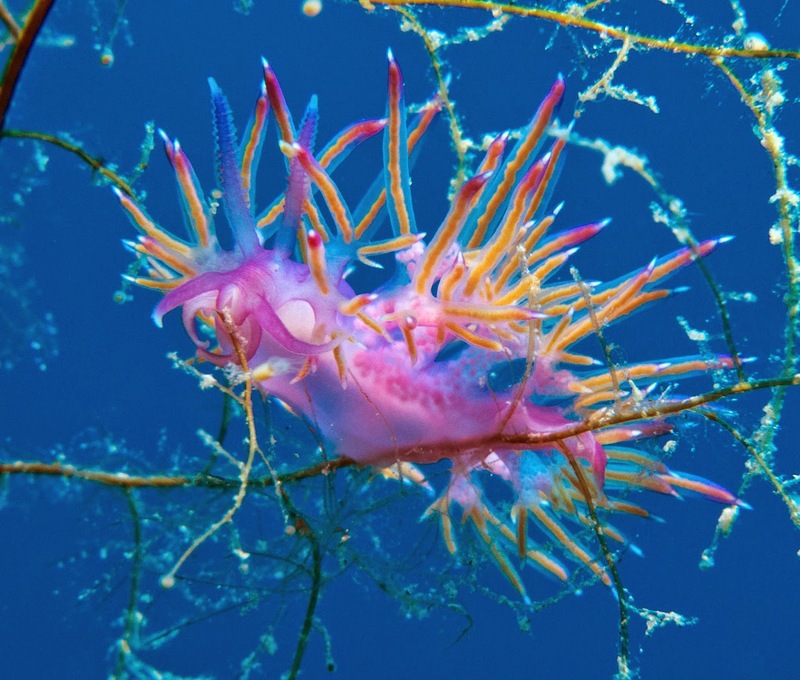 It doesn't matter whether you have been Scuba Diving for fifty years or only started last week, at some point in your life as a Diver you will or will have felt some nerves and stress before making a dive. Maybe you are diving with new people, at a new dive site or different conditions that are a bit more difficult than you are used to. Stress on a dive in small amounts is not always a bad thing but excessively, it can cause many problems and dangers, so here are 4 tips to combat that stress before you even get in the water. The best way to avoid stress over using new Dive Equipment is to have your own and to have dived with it many times. However, there will always be times when you need to rent equipment or have upgraded your own and your kit is new. How can we manage nerves at these times. There are many resorts around the world where the staff insist on setting up all your equipment for you and you simply get to the dive site or on the dive boat, put the equipment on and get in the water. I would recommend against this and set up the kit yourself. If you are diving it, this gives you the opportunity to check all the components prior to getting to the dive site. As you were taught from your first scuba lessons, put everything together, open the scuba cylinder and check for any leaks and hissing. The regulators should breathe easy with no fluctuations on the gauges and no funky smells or tastes to the air. Check the inflator too. Inflate your BCD fully until the Over pressure release valve blows off, then check the deflator and any emergency pull dumps too. Participate in the dive brief. Your guide or instructor will go over the dive profile, what you are likely to see, points of interest and hazards, turn pressures and signals but if there is something you are unsure of, ask questions. If you are diving with a buddy, discuss the dive plan together until you both are 100% sure of all aspects including separation and out of air scenarios. Divers that understand fully what to expect on a scuba dive tend to be more relaxed about it. Be ready to communicate with your buddy or guide. As professionals, we have certain signs that will indicate to us if you are nervous or stressed before a dive and while we try our best to detect such signs, the best way to let us know is to tell us. A discussion can often reassure divers when they are nervous, reminding them of information they have forgotten but sometimes, when the stress cannot be reduced, it may be better for everyone to alter the dive plan and negate the nerves before they can cause a problem but communication is key to this. Remember your pre-dive safety checks too. We recommend that you talk through your equipment with your buddy, so you know that they know how your equipment works in the event they need to help you underwater or at the surface. This is a firm rule that is applied ANY time, ANY where. If for any reason you are not comfortable making a dive, ABORT it. Although there might be some disappointment, any diver worthy of being a buddy will be happier to cancel than have problems underwater. It isn't worth the risk to dive when you are not 100% sure you are ready and nobody will think any less of you for it. Sometimes, just knowing you can abort at any time is enough to put a diver's mind at rest and ease those pre-dive nerves. As Scuba Divers, we do tend to get around a bit and there are always new places we want to add to the "bucket list". So, I thought I would share five quick tips that will help you dive anywhere in the world. We do believe that when you are diving somewhere new, it is best to get an orientation from a diver that knows the site well. Most commonly, this comes in the guise of a guided dive. The dive resort/dive centre hires you a guide to take you around the local dive sites and they can point out the things of interest and any potential hazards. It is also nice because the guide will help remind you about decompression limits and air supply, reminding you to check them frequently while you are diving. If it is not possible to get a guided dive, at least ask someone who has been diving there before. You will enjoy the dive more if you have prior knowledge of what to expect, what you are looking for and how to stay safe. Different places require different equipment depending upon the conditions and once you have had an orientation about the conditions, you should know what to expect. There is no point turning up in Cyprus in August with a drysuit and thick thermals, as you will end up overheating. 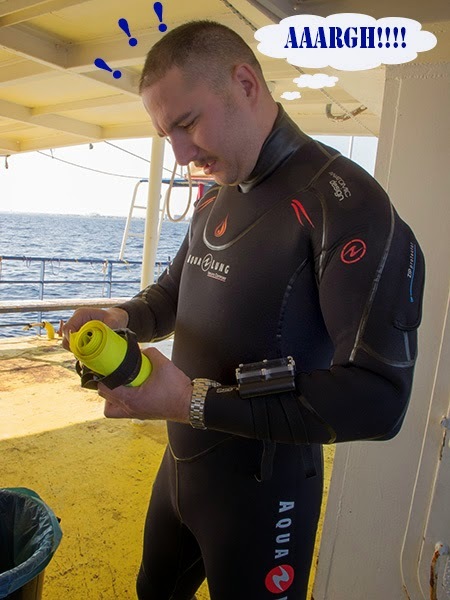 Equally, where sea diving in the UK may require reels, DSMBs, torches, compasses, pony bottles and all the other life saving pieces of equipment that leave you looking like a tree at Christmas, here in Cyprus, the bulk of the diving does not require this kind of kit. So, do yourself (and your wallet if you are trying to fly) a favour and find out what trimmings are needed before you pack them all up. Every diver that does not want to be caught short on a dive should carry a small, basic tool box. Many has been the time, we have been out and about to be asked if we happen to have an Allen Key, spanner, screwdriver or some simple tool that doesn't take up much room but can mean the difference between making the dive and having to cancel. Even something as simple as; Schraeder Valve Removal Tool, Allen Keys (Imperial and Metric because you never know), a couple adjustable spanners, O-Rings in various sizes and a pick to remove them safely, spare hoses and good old faithful Tie Wraps should see you through most situations in a pinch. DSMBS are an extremely useful tool to have at your disposal. They can mark you out for boat traffic and allow you to make an ascent from practically anywhere by providing a reference line to the surface.Some areas for diving, it is mandatory that you carry them but I have seen many divers with them attached with no clue how they work! 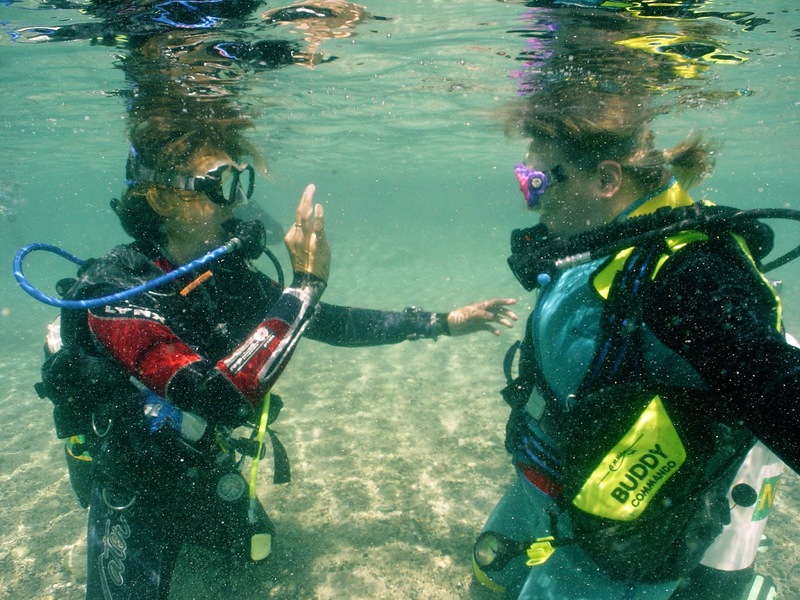 Setting off a DSMB is now taught in a PADI Open Water course as a compulsory skill and those of you who have been diving for years without ever using a DSMB should get caught up by asking an instructor or buddy to show you how it is done. You do not need a course, just a demonstration and a bit of practice but this is definitely a skill every diver should have. God forbid something goes wrong on a dive but unfortunately, it does happen sometimes. Even if you have been diving safely for years with no incidents at all, there is always a first time. If something happens on your dives, would you know how to handle it? Get the number of the Emergency Medical Services for the area you are diving in and, of course, the local hyperbaric chamber. In this day and age of mobile phones, you don't usually need to locate a nearby pay phone but it is always useful to know in case you find yourself without signal. How far away is the nearest chamber and do you have your own Oxygen Kit in case of emergencies? In water, make sure to practice your emergency procedures because, although these are skills we all hope we will never need, in the unlikely event of an emergency, you want to make sure you and your buddy are up to the task. As I mentioned at the start, these are just 5 little tips to help make your diving anywhere in the world a little easier, a little safer and I hope you find them useful. Please add your own contributions in the comments below and whatever else, DIVE SAFE! 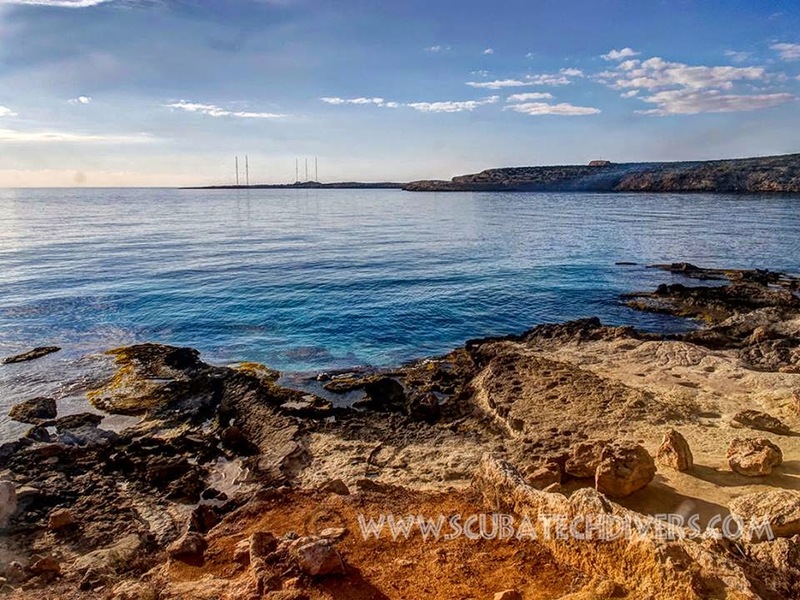 Continuing our log of the Cyprus Sites for Scuba Diving, we come to our second most popular Dive Site, which is known by a couple different names depending on who you dive with! We call this dive site Cyclops, as at the top of the cliff, you will find the cave that was once home to the one eyed monster and legend has it that he is still there deep within. Others call it the Cliffs or Cape Awkward. I have to admit that this is my Favourite shore based Dive Site, since you never know what you will see here. The fish life can vary from tiny little nudibrancs to large schools of amberjack and sometimes Tuna. 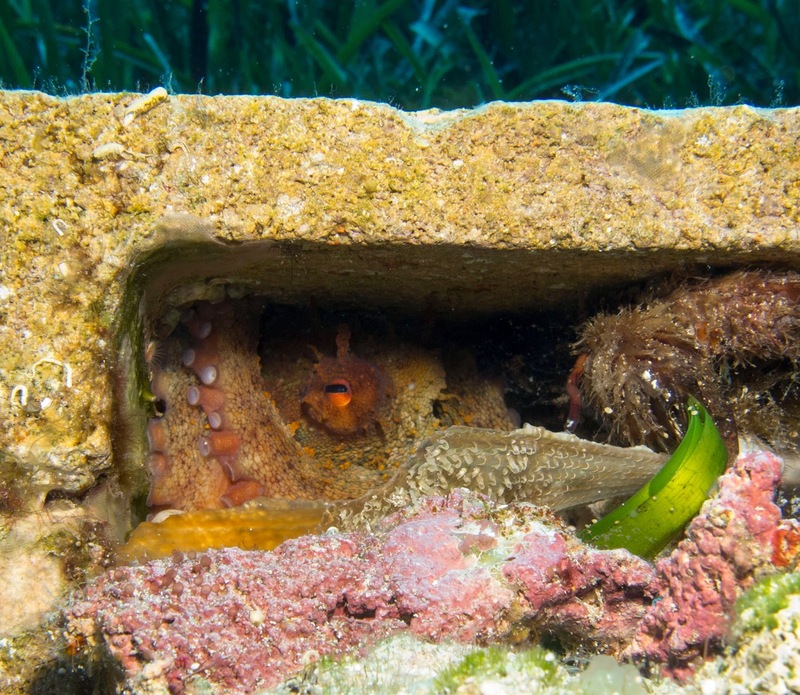 Somewhere in the middle, you can find Moray Eels and Octopus, the occasional seasonal Squid and Trigger Fish. If you are very lucky, turtles can be spotted here too! The dive begins with a backward roll entry and underwater, the seabed gently drops away over rocks to about 3 metres where you will find a sandy runway that runs parallel to shore, sloping to 9 metres. Once at this point you can choose to follow the rocks down and around to 25 metres then head off deeper (but be sure to take a compass, as the bottom turns to sand and it can become somewhat disorienting) to 40 metres +. Alternatively, you can start to ascend from 25 metres or remain shallow at a respectable 14 metres for the whole dive. At the far turning point of the dive, there is a cliff wall stretching from the surface to the seabed at 14 metres, which looks spectacular in the morning light and all around you on the ground, are clam beds so be careful where you put your fins. This dive site does have the potential for current but it is usually pretty mild and the current often signals there will be plenty of life to see. All in all, this is a dive site that has a little bit of something for every level of diver in Cyprus. So, come and Dive it!! 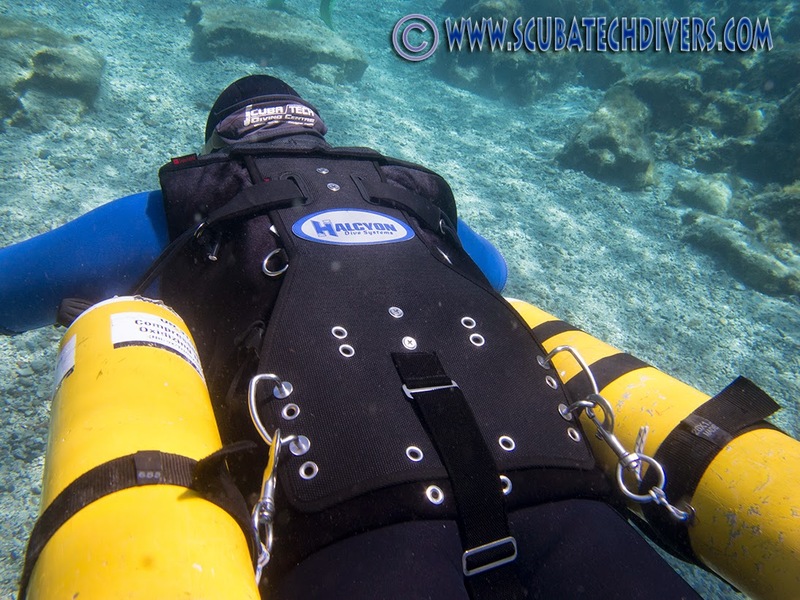 I was recently sent a Halcyon Contour Sidemount System to trial here in Cyprus and although I didn't really know what to expect from it (there is a lot of info on the Internet but all seems to be the PR pitch from Halcyon themselves), knowing the quality and expertise that goes into the development of other Halcyon Products, I was very excited. The box arrived and, like a child at Christmas, I delved in to find my new toy! 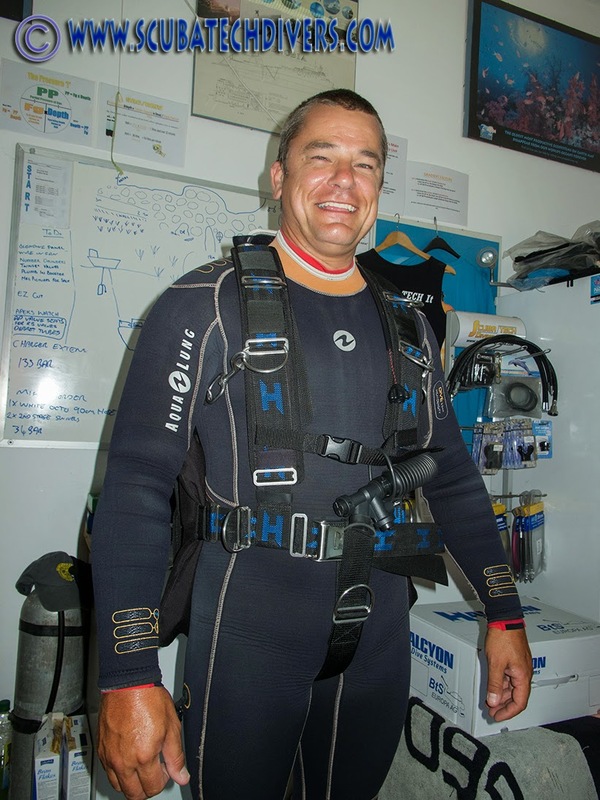 As a shorter guy, the size did concern me somewhat but, once in the water the whole system seemed to mould to my body and I have to say, was one of the most comfortable sidemount system I have had the pleasure of diving with. The system is pretty much usable straight out of the box. We currently use the Razor System here at Scuba Tech Diving Centre and I have taught students that have brought their own systems including the X-Deep and the one thing that drives me crazy with them is the time it takes to adjust the system for the student. An extra half day is required just for the initial set up. Halcyon's Contour System is different. Aside from the usual harness and crotch straps that need adjustment, the system is pretty much ready to go and you can be in the water in about 40 minutes. This is a real bonus for teaching and if you change regularly from wetsuits to drysuits etc. 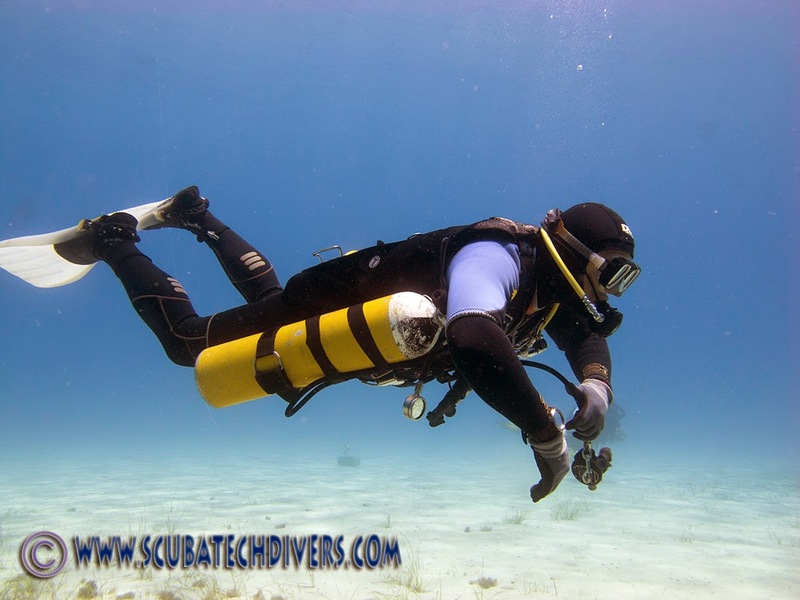 Equally, as opposed to the complex weight distribution systems of other sidemount systems, the Contour has simple weight pockets that can be mounted to the top or bottom of the contour depending on your preference. Not sure what weight you will need? No problem, do a weight check at the site and have a buddy pop the correct weights into the pockets for you!!! This was the most comfortable Sidemount System I have used. The padded backplate and straps sit well and the wing design lowers your centre of gravity to counteract the lower Sidemount Cylinders, which makes the whole thing very stable and trims you out remarkably well. I particularly like the OPV on the shoulder. I know many avid Sidemounters may be shocked at this but I like to be able to quick release gas from top or bottom of the system depending on my orientation. Inside a wreck or other confined space, I might not be able to get my bum up high enough to release the air from the bladder, so an extra option is a bonus. I have been diving with the contour for about a week now and so far, there is nothing I haven't been able to do with it. There are D-Rings on the waist for diving aluminium cylinders, extra D-Rings on the back for mounting light canisters etc and I think the rails will definitely come into their own when I move back to cold water Sidemount Diving and using steel cylinders. So, and this is just my opinion, I think this Sidemount System is definitely one to watch out for. I like my diving to be easy and comfortable and this certainly fits the bill while being fully functional too. What more can a diver ask.... except, CAN I KEEP IT?